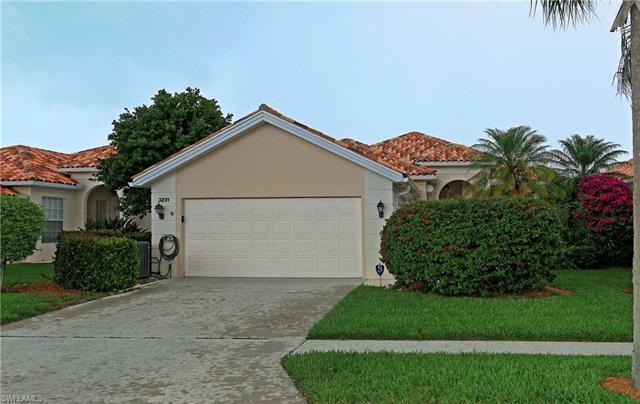 UPGRADED 3BR/2BA w/den Oakmont Model pool home in the fabulous community of Village Walk in Naples. NEW ROOF and GUTTERS. The owners have meticulously maintained this gorgeous home. There is a large screened in private pool with lake views and mature landscaping. Features and upgrades include: Remodeled Master Bathroom, Manual hurricane shutters, plantation shutters throughout, crown molding, new carpets, Newer appliances and refaced kitchen cabinets. It also has a very open floor plan and tile in the main living areas. Village Walk is a 24 hour guard gated community with a unique Town Center which offers a fabulous restaurant and bar, 6 har-tru tennis courts, 3 community pools, fitness center, bocce courts, library, hair salon and a community room. The community also has miles of bike and walking paths. Great location, minutes to the beach, dining, shopping, entertainment, boating, fishing and golf courses. Move in Ready. Call for more details.